As Trivandrum witnesses unprecedented growth and investments of over $4 Billion are underway in transportation infrastructure in and around the city, it is high time to ask whether we have a metropolitan transportation strategy for Kerala's Capital? Trivandrum has been a Capital city and a center of economic activity and culture for a long time now but in the past few decades, the city's growth has accelerated rapidly as it established itself first as a center of education and research and then as one of India's top information technology hubs. Today, it's one of India's most vibrant and most affluent cities, poised to make the transition from Tier II to Tier I in the next few years, powered by rapidly expanding sectors such as the technology industry and the logistics industry that will be spawned by the upcoming $2 Billion Vizhinjam deep-water port. Trivandrum is the largest city in Kerala, with a Corporation comprised of 100 wards and the only one large enough to qualify to be a metropolitan area on its own. The larger Metropolitan Area around the core city has expanded to include most parts of the district, from Attingal in the North to Neyyatinkara 45 Km to the South and as far inland as Nedumangad which lies about 20 Km from the Arabian Sea. As an economic engine, Trivandrum attracts people from across Kerala, India and the world. However, daily commuters tend to come from areas as North as Kollam, a city with a million people of its own, and as far as South as Nagercoil, on the other side of the State line. This is in fact, the true metropolitan catchment of Trivandrum, at least as far as the transportation perspective is concerned. With an estimated 500,000 daily commuters likely to be traveling around within the metro area by 2018, a metropolitan level transportation plan is long overdue. This is no surprise, shocking as it may seem at first glance, because the metro still has no comprehensive urban Master Plan, although there finally seem to be some stirrings in that direction. The definition of a metro transportation is simple as it is significant in a strategic sense - it is a comprehensive, multimodal “blueprint” for transportation systems and services aimed at meeting the mobility needs of the metropolitan area into the near future, according to the North Central Texas Council of Governors. The plan intends to ensure that transportation services and systems are adequate to support the economic development of the metro area and to provide a high quality of life for its residents at the most optimal total cost. There have been bits and pieces of transportation projects and plans in the recent past, most notably KSTP, TCRIP, JNNURM and the development of regional roads and the National Highway under various State and Central schemes. Add to that a myriad agencies - State and Central Governments, the Trivandrum Corporation, TRIDA, NATPAC, the Indian Railways and so on - that tend not to work well with each other or even be interested in doing so. At best, their efforts create a chaotic transportation scenario, at worst a completely dysfunctional one. The abject failure of the past makes it the need for an integrated transportation plan even more stark as well as the need for a Metropolitan Transportation Authority/Agency (MTA), not only to coordinate the plan but to take over, implement and operate most, if not all, of its constituent systems and services. A single agency is better able to fund and manage diverse systems and in the end, there is a single point of responsibility to work with (or to blame!). The key arterial road in the Trivandrum metro area is the North-South NH 66 (formerly the NH 47). Its old alignment, through the center of the city forms the arterial M.G. Road while its current alignment along the coast connects all the main development nodes of the metro area including its technology super-cluster, the main ISRO campus, Kochuveli railway station, the International Airport and the giant deep-water port before heading South towards Tamil Nadu. Another arterial North-South road is the MC Road which runs down the middle of the coastal plain from Central Kerala to Trivandrum and merges with the old alignment of the NH 66 as it enters the city core. Several major roads criss-cross the city and its suburbs, connecting major nodes to the city center and to each other. There is a double-track rail line that roughly parallels the old NH 66 alignment although there are no true commuter/suburban services on it yet. A comprehensive transportation plan is both a consequence of and a determinant of the metro area's urban plan because its routes are decided based on how populations and activities are distributed at present and in the future, while these routes can help determine which areas attract businesses and residents in the future. A true chicken-and-egg scenario. In this sense, the planning exercise has to start with identifying the current pattern of sources and destinations of traffic as well as the projection of the pattern into the foreseeable future. While a true plan process is an extremely complex, multi-stage proceeding involving everything from opinion surveys to computerized travel pattern modeling, let's try and go through a simplified version here. First of all, there are three primary types of nodes that need to be understood and incorporated into the plan in order to accommodate current and future travel demand. A) Activity Centers: Locations that have some form of economic activity to and from which large numbers of people commute on a regular basis. Eg: Technopark, Technocity, Secretariat, Vikas Bhavan office cluster, ISRO main campus, Kerala University Karyavattom Campus, Medical College hospital cluster, M.G. Road high street retail etc. B) Traffic Sources / Catchments: Locations where commuters reside or portals through which people arrive into or leave the metropolitan region. C) Future Development Zones : Locations with potential for development, with wide availability of developable land and proximity to current activity hubs. Nodes in the first two categories already see significant traffic of commuters as they move to and from the locations of their primary engagement - workplaces, educational institutions and retail. Thus, the interconnection of these nodes assumes first priority both from the perspective of catering to the maximum existing demand as well as that of maximizing the ridership and thus the viability of any transportation system. The last set of nodes is where relatively inexpensive land is available for development if adequate access is provided to reach critical nodes such as work places, transportation centers and retail. These will see significant commercial and residential development as soon as access is available. For example, a well designed mass transit system can bring relatively undeveloped areas such as the eastern or southern fringes of the metro area within 30 minutes of employment hubs such as Technopark-Technocity. The transportation plan can play an important role in ensuring that development is radial, instead of stretching out in either direction along the NH-66, for example, and thus minimize urban sprawl which is a wasteful form of growth. Conversely, improper planning, such as the auto-oriented plans seen in the past in many US cities can promote sprawl. Once the sources and destinations are identified, the next task is to estimate the traffic demand between various such pairs and the preferences of various segments of travelers such as their need for speed (no, not the game!) and their willingness to pay for various levels of service. Another key input could be the urban Master Plan for the metro area to estimate future demand patterns. All of these inputs, usually very complex and voluminous, are fed into a sophisticated modeling program such as TransCAD.The results can be interpreted to identify key transportation corridors. Then, based on parameters such as capacity, cost, topography and so on, the best choice of technology can be chosen for each corridor - from the simplest interventions such as road improvements to the most complex ones such as mass transit systems. Or we could skip all this and pick one technology out of a hat (or any convenient tin which happens to be lying around). This seems to be what is going on in Kerala and much of India today. Kerala has a few white elephants running amok but precious few bottom-up transportation studies. In all its wisdom, the Government has decided on a monorail-based mass transit system in Trivandrum and even hit upon a route before the transportation study was even commissioned! At various points in time, rail-based solutions and Bus Rapid Transit did the rounds, the latter even got in-principle Cabinet clearance in 2009 and then vanished into thin air. So monorail it is, which may not be the worst choice for a city of Trivandrum's size given its capacity, capital and operating cost characteristics and its relative unobtrusiveness (compared to the bulkier rail-based systems). Of course, if we had unlimited resources as some misguided folks who believe in the religion of the white elephant (...I am not referring to Thailand) seem to think, Trivandrum should have a fully underground system but it would probably be too expensive and far more than what the city needs in the foreseeable future. Perhaps, the monorail could be underground for its stretch within the core city? 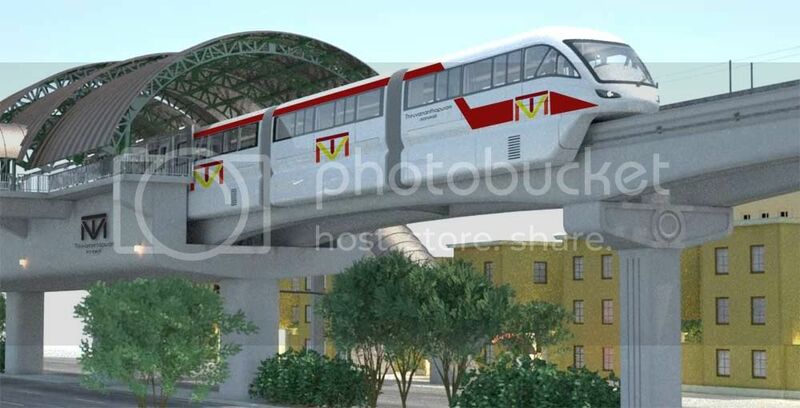 As currently proposed, the monorail system will have one route running for 42 Km between Technocity and Neyyatinkara and will be developed in two phases (Technocity to Thampanoor being the first phase) at a total cost of Rs 5500 Crores. It is expected to be operational by early 2016. This alignment connects a number of key nodes including Technocity, Technopark Phase I, Kerala University, the city center, the rail and bus terminals at Thampanoor and the key suburbs of Balaramapuram and Neyyatinkara. However, it misses out key nodes such as Technopark Phase II & III, Aakulam, Kochuveli rail terminal, the International Airport and Kovalam-Vizhinjam being the notable ones. This could be easily fixed by aligning the system along the NH-66 (the new one) between Kazhakkoottam and Aakulam (the current proposal along the old NH-66 between Karyavattom and Ulloor has very few, if any, significant nodes along the way) and perhaps this will be given serious consideration when the Detailed Project Report is prepared. NATPAC, which prepared the proposal does not seem to have looked at the broader context beyond the one route (because it was not in their mandate? ), except for recommending the inclusion of feeder bus services using low-floor AC buses in the project. Multi-level Car Parks (MLCPs) have been proposed at select stations to create facilities for a Park-and-Ride mode of travel that will help attract commuters from outlying areas while at least one sky-walk has been proposed, at Thampanoor, to enhance pedestrian connectivity between the monorail and the railway station and East Fort. A second route could developed starting at Kazhakkoottam, running along the NH 66 - connecting Technopark Phase II & III, ISRO, Aakulam and the Kochuveli rail terminus - till Chackai (and the Airport) before heading East to Palayam and then, via Vellayambalam and Peroorkada, to Nedumangad (which also hosts ISRO facilities, the IISST and the IISER). This route would span approximately 25 Km and cost another Rs 3000 Crores. Together, these two routes would link up almost every important node except for Vizhinjam-Kovalam. High capacity bus services (either with or without segregated right of ways) could help compliment the monorail system, running along a ring route starting from Kaniyapuram, via Vembayam, Nedumangad and Malyinkeezhu, to Balaramapuram as well as along the NH 66 between Vizhinjam and the Airport. These would ideally utilize low-floor, AC, articulated buses that could provide high levels of service along the corridors and help open up the suburbs to development even without direct monorail connectivity. A number of feeder bus routes have been proposed along with the current monorail route. Both these and the high-capacity buses mentioned above needed to be integrated closely with the monorail system, both in terms of schedules and ticketing. This is yet another reason for having a single MTA to operate all these services. Another reason is that to entrust any of the bus services to KSRTC is to invite certain disaster, in view of their "inglourious" exploits with any new bus system, the latest of which is the gross mishandling of the 280 buses gifted to them under the JNNURM scheme. There are going to be a lot of people kicking and screaming about the creation of a MTA and the surgical removal of the KSRTC's single biggest and most lucrative operation - Trivandrum's city services. As currently proposed by NATPAC, almost every feeder route runs from a monorail station to an outlying point. For example, Mangalapuram - Attingal and Sreekaryam - Kulathoor - VSSC. These hub-and-spoke services make sense for connecting monorail stations to faraway points, it makes better sense to connect closer points to the monorail using loop services which originate at one station and terminate at another. 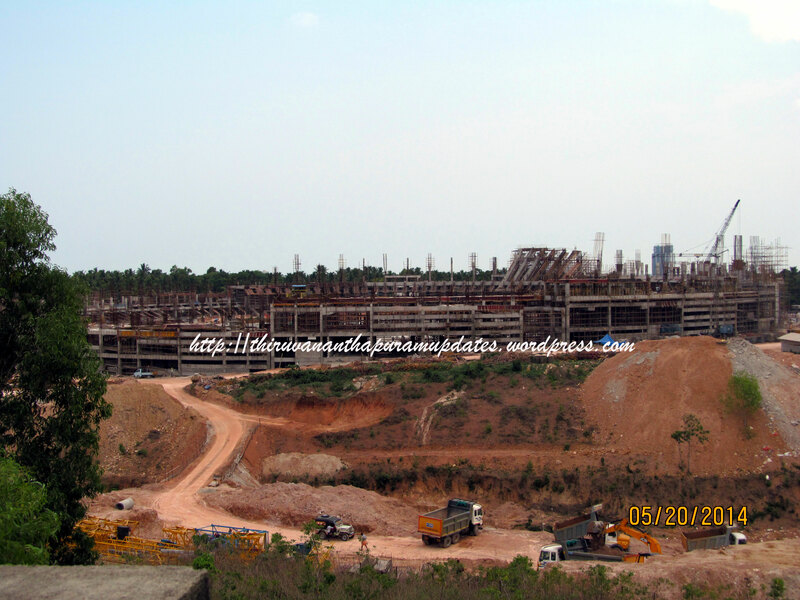 Let's take Kazhakkoottam - Technopark Phase III - CET - Sreekaryam. Someone from TP III wishing to travel to Attingal can take a bus heading to Kazhakkoottam instead of taking one to Sreekaryam and then doubling back to Kazhakkoottam as they would have to with a hub-and-spoke option. The MTA should take over all city bus services to ensure integration with the mass transit system and its feeders, converting all the routes first to low-floor buses and then to AC vehicles. You may ask why all that cost? The incremental cost of AC buses (a smart choice would be to add AC packs to the non-AC, low-floor buses) would probably be more than offset by the added ridership of private vehicle users being converted to public transport due to the increased comfort and levels of service of the new buses. Eventually, to really wean people away from their own two and four wheelers, they have to be offered similar comfort and flexibility, at a lesser cost. 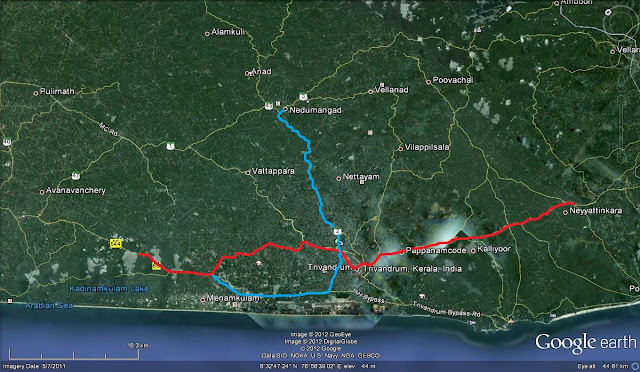 This route can connect the important radial roads like TVM- Nedumangad, TVM- Kattakada & those through Sasthamangalam with TP/Technocity area thus boosting the development of city periphery. Circular services could also be launched in this case. From Karyavattom to Technocity area where land is available, IT space (in conjunction with Technopark) & shopping area could be developed near the Monorail stations (For funding MRTS & providing sustainability for the route). I am sure companies will love having their office/shopping space near an MRTS station.